You came to Orlando, Florida for Disney. You did LEGOLAND, Universal Studios and now you need a little down time. They want to keep going. Time to hit Crayola Experience! Let the kids learn and encourage their creative juices while you spend much-needed time off your feet and watching them just be kids. Heaven. Yes, Crayola is crayons. No, this is not a crayon factory. Well, it kind of is, but so much more. 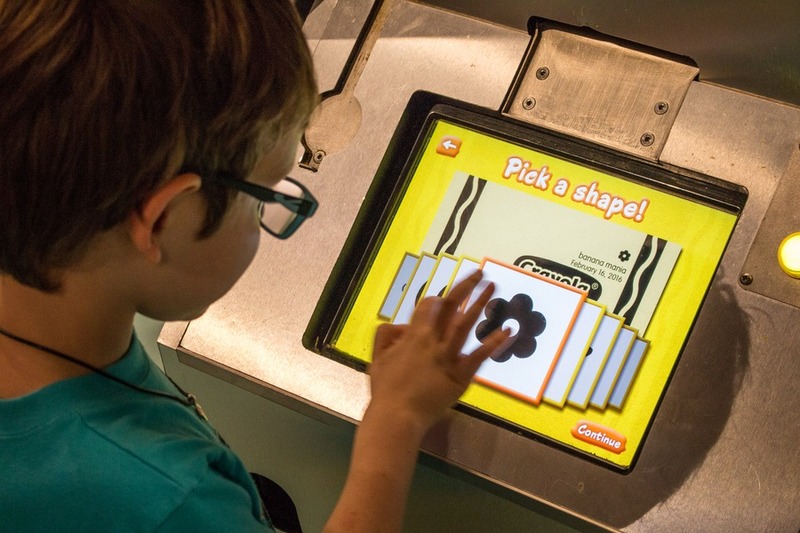 Crayola Experience Orlando is an interactive, hands-on creative outlet made of colour and fun. They offer over 25 attractions across 70,000 square feet of space next to Florida Mall. After all the mind-numbing in-depth planning we went through for Disney World and Universal Studios, it was a relief to just turn up somewhere and have fun. 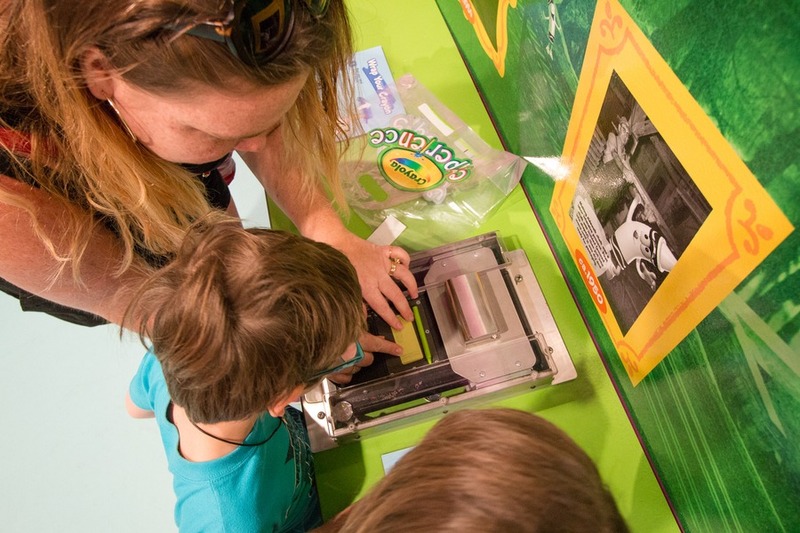 No need to check complex park schedules, long checklists or cross fingers for agreeable weather – Crayola Experience is all indoors and open every day of the year from 10am to 8pm. When we told the kids Crayola had asked us to come check them out, my creative, artistic genius daughter was over the moon. She even drew us a Crayola crayon-shaped family leading up the day. The countdown was on. Crayola Experience didn’t fail to inspire the kids as we pulled into the carpark, enormous bright colourful crayons greeted us, adorning the entrance. In the entry foyer 3 digital crayons on a projector screen were fast asleep… until my kids stepped on their tiny feet markers. Then the crayons came to life, imitating any pose imaginable. After much coaxing, I managed to convince my kids there was more to see and do, and we all headed upstairs. With your entrance ticket you are given tokens. These tokens are used around the complex for different attractions. You can make your own personalised crayon or even “buy” a marker or a pack of crayons. The token concept was not explained to us, but we quickly figured it out. The only thing we missed was the creative table which required moulding clay that can only be purchased with a token. By the end of the day the kids had haphazardly used all their tokens not realising there were other attractions to spend them on. If staff had mentioned how to use (and save) them, it would have been more helpful. Luckily (or rather unluckily, depending on how convincing your kids are) you can purchase extra tokens. What Do You Do At Crayola? 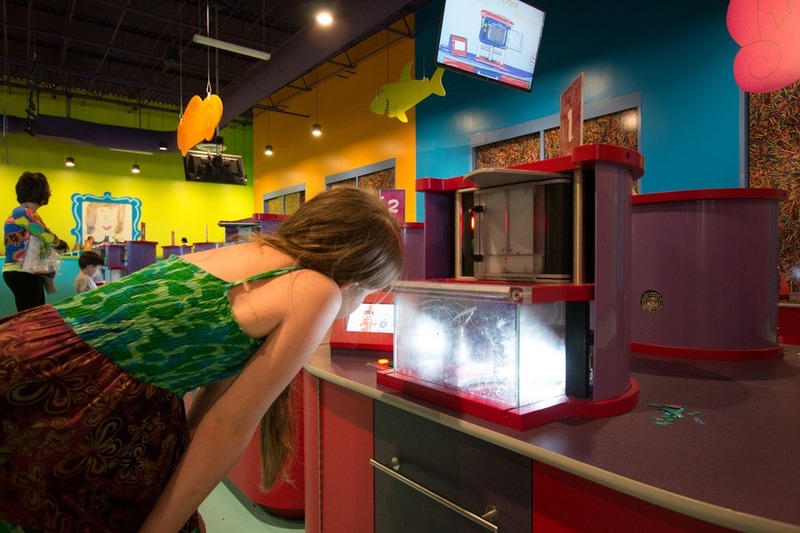 There are plenty of activity stations that will keep your kids entertained for hours on end. Kids can bring their colouring to life. They can star in their own colouring pages. They can watch their creative designs on the big screen. 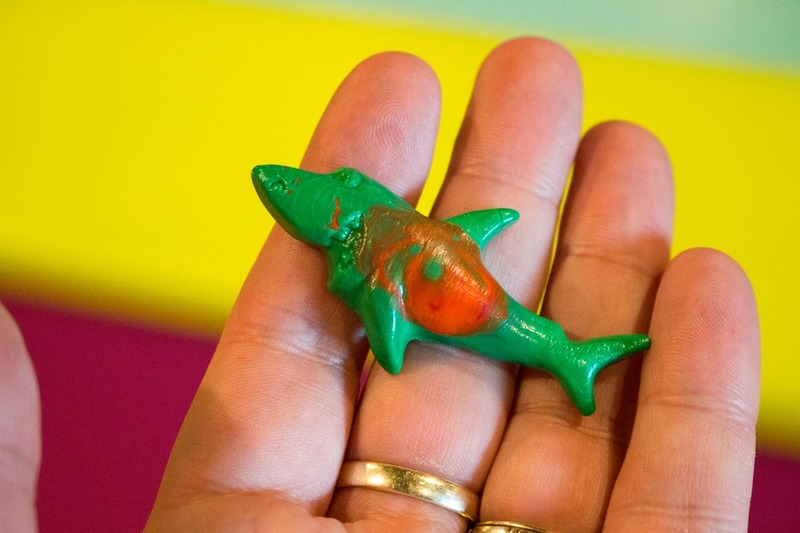 Our kids loved melting crayons to create rings and sharks. And melting crayons to make a spinning, creative piece of art. There’s an indoor playground and a fascinating live show explaining the process of how Crayola’s crayons are made. And my favourite… a photo booth where you can print yourself in crayon. We made some hilarious family portraits! 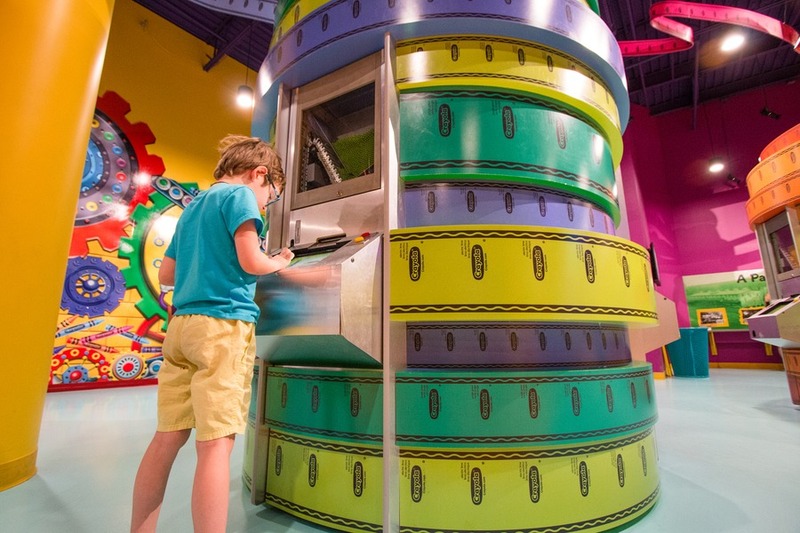 There is a small snack shop at Crayola Experience Orlando that sells pizza, salad and sandwiches, but no full restaurant. We got an exit stamp and found lunch at the food court in the attached shopping mall. Then we were back for more Crayola fun. Our kids couldn’t get enough. Without a doubt. Even my pencil-phobic 5-year-old adored Crayola Experience. It’s a valuable educational experience where they can learn something other than how to ride a roller coaster. Best of all it's not too big. You can take a seat in a central spot and easily watch the kids run around. It’s the perfect way to spend a day after all the theme park madness.